The Student Organisation on International Affairs (SOIA); encouraging political discussion and promoting student opinion on current affairs. The Islamic State’s rampage throughout Syria, Iraq and the Levant continues to trouble the Western world. Undoubtedly a serious issue, but is the West neglecting other crucial – possibly more important – domestic or international affairs? 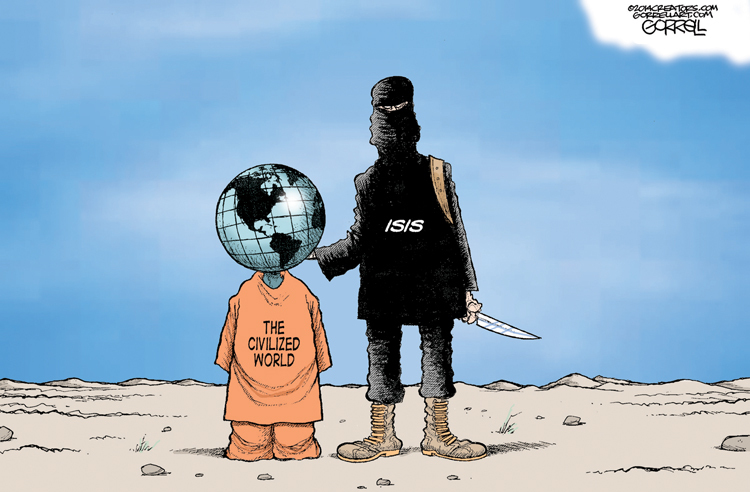 The “ISIS Crisis” continues to shock the world today. Understandably, it’s easy to be anxious about the threat posed by the self-proclaimed caliphate. After all, the Islamic State is a brutal organization that does more than just kill; it revels in its brutal and barbaric methods of torture and modern day slavery. The United States President, Barack Obama, recently claimed that ISIS will be a “generational struggle.” Moreover, British Prime Minister David Cameron made similar remarks shortly after, saying Islamic extremism is “the struggle of our generation.” However, is the Western world – US, UK, Germany, France – overly worried about ISIS? Is the West falling for ISIS’ bait, like it did with al-Qaeda? Nonetheless, the most important question that should be asked is, are countries neglecting other pressing issues, such as: climate change, global economic instability, mass migration, nuclear non-proliferation, and regional confrontations, because of the Islamic State? Having changed the nature of terrorist organizations, ISIS has capitalized on mass media to spread terror. The Islamic State is an effective communicator which has been essential to its recruiting scheme, which has now enlisted over 3,400 foreign militants. This means that the ideological battles are not just being fought on the ground, but on the world wide web as well. While their gruesome videos would seem to be a repulsive turn off – and are to most people – ISIS are still present online. The horror they produce results in their videos going viral on mass media platforms, and thus are seen by tens of millions. That ensures that their videos, reach the alienated and subversive young men – a few thousand among the world’s 1.6 billion Muslims – who seek revenge, glory and gore based on a misguided interpretation of the Quran. Unfortunately, as long as these young Muslims targeted by ISIS’ propaganda support their cause, the the world will continue to fret over a danger which grows by the day. However, a lot of society’s fear has been built up by the traditional media’s extensive coverage of the issue. At many points, the reporting can seem excessive and hyperbolized. Nevertheless, the sad truth is that fear sells. A study done by Pew Research Center has shown that people are more likely pay attention to news which they deem as life-threatening. In this era of communication, the media has the ability to shape public opinion. 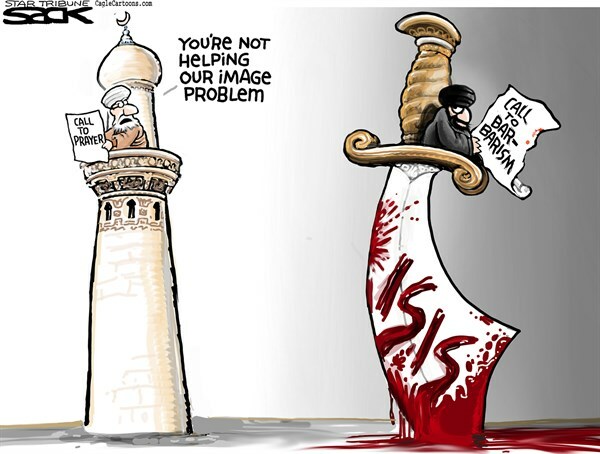 When the media continuously reports on the loathsome acts of ISIS – a terrorist organization whose members happen to be Muslim by faith – it is not that hard to do what religious scholar Reza Aslan calls “…painting all muslims with one brush.” Both non-Muslims and muslims are appalled by the Islamic State’s actions which they justify as ” in the name of Islam.” Yet, misunderstanding and prejudice seem to grow inside those who do not fully understand. 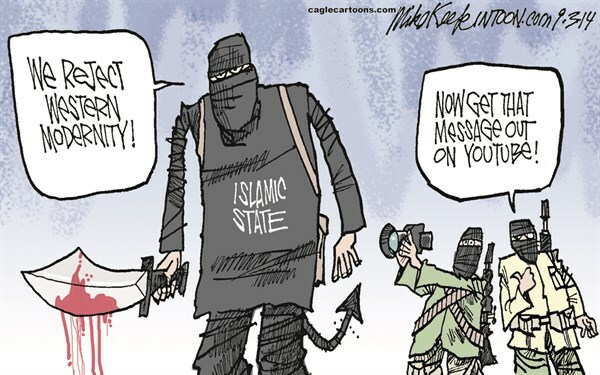 The media’s depiction of a fundamentalist and extremist Islam is what resonates in many minds. Furthermore, the dramatic and superfluous news reports can cause people to become overly worried. Alongside probable “personal interests,” this results in the issue being pushed higher up the political agenda. The West should take caution when measuring up the counter-response. Primarily because the Islamic State’s “propaganda” could very-well be used to bait the West into making rash military moves. Scholar Fawaz Gerges writes that the leader of IS – Abu Bakr al-Baghdadi – noted that IS was not ready to attack America but “he wished the U.S. would deploy boots on the ground so that IS could directly engage the Americans — and kill them.” The West must take a step back and analyze the geo-politics. Military intervention should be coupled with smart political strategies. The Islamic State is a direct outgrowth of the 2003 invasion of Iraq and the crippling political maneuvers which disbanded the Iraqi army and “de-Ba’athified” its bureaucracy. All of which resulted in a disempowered, enraged and armed Sunni population who then started an insurgency. VICE media’s documentary on the group interviewed Iraqi Sunnis who said that for all the chaos, they were happier under the Islamic State than under the “Shiite army,” which is how they perceive the Iraqi government to be. Therefore, military intervention will only work if there is an equivalent – or perhaps an even more intense – political policy. Yet, it is important to remember that the Islamic State is not the sole problem in today’s world. 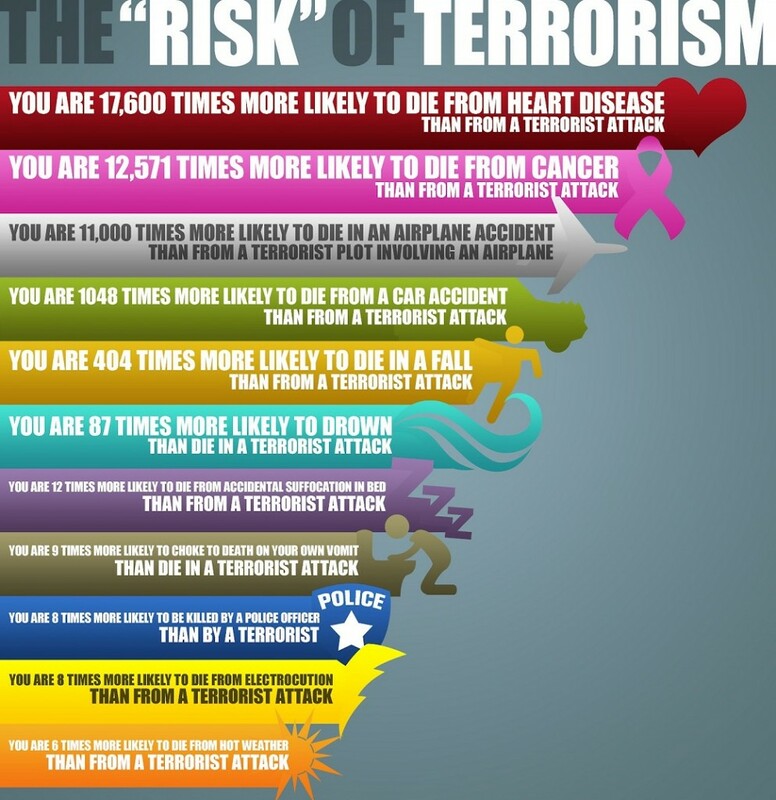 Professor Michael Jetter from the School of Economics and Finance at Universidad EAFIT in Medellín, Colombia points out that forty-two people die everyday due to terror attacks, compared to the 7,123 children who die from hunger-related causes. Other pressing issues such as global economic instability, migration and regional tensions threaten societies across the globe. In the case of global climate change, all of mankind is one boat. Yes, a terrorist organization as merciless as ISIS should be defeated. Despite that, the West should find the balance when it comes to its approach. It is essential that western governments are not blinded by the “Isis Crisis,” and overcommit to the war on terror while neglecting the many challenges in today’s world. Posted in Opinion, World and tagged ecolint, featured, IS, ISIS, la chat, newspaper. Bookmark the permalink.